Todos Santos is a beautiful oasis about an hour north of Cabo San Lucas. With dozens of pristine beaches, whether you enjoy surfing or just want to relax, you will love this touristy yet quaint pacific ocean town. Getting hungry from surfing all day? The food here is to die for. From delicious one dollar tacos to 5 star cuisine, Todos Santos has it all. 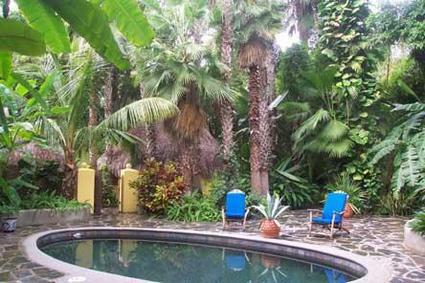 You may never again be in gardens so lush -- towering palms, ancient mangos, shady bamboo groves, countless banana trees. 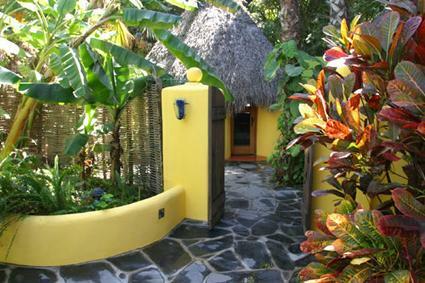 Relax by the pool, beneath the bamboo groves in the lower garden area, or perhaps on your private patio. In the tranquility of our gardens, time moves as gently as the breezes. All this is only a three minute's walk from the heart of town. When you come in from the gardens, or from shopping and dining, the comfort of your palapa casita will greet you with its elegant fabrics, original art, cd stereo system, wireless internet, all at hand for your comfort and convenience. $110 per night - discounts available for 1 week or more. If you have any questions or would like to make a reservation please call our U.S. number at 805-201-3170, or 011-52-612-118-1976 for our local cell. Private entry into casita #1 from the pool area.